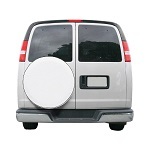 Attractive protection for spare tires on RVs, vans or trucks - Available in Grey or White. Keeps weather and debris out of RV air conditioners. Provides privacy and keeps interior cool and protected. Patented screen keeps out bugs and shades the interior. 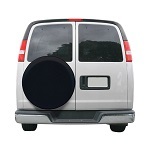 Classic Accessories 75347 Black Universal Fit Spare Tire RV Cover 26.75-29.75"